The Food Alphabet and More: Win tickets to The BPI Big Outlet and Travel Sale!!! 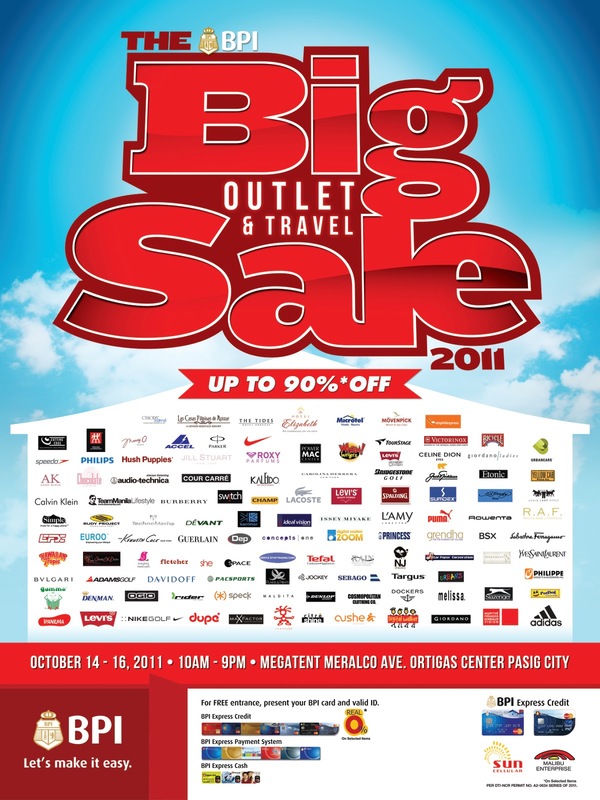 Win tickets to The BPI Big Outlet and Travel Sale!!! Brands on parade include PowerMac Center, Ipanema, Levi's, Nike Golf, Dupe', Rudy Project, Crumpler, Cushe, Hush Puppies, Melissa, Adidas, Puma, Devant, Nike, Accel, Rustan Marketing Corp. Cutting Edge, JA Henckels, Manny O Wines, Canopy Homes, Parker, Chocolate Clothing, Dockers, R.A.F., Plains & Prints, Guerlain, Grendha, Giordano Ladies, Pac Sports, Sebago, Targus, Switch, Digital Walker, Audio Technica, Ideal Vision, Speck, Slazenger, Maldita, and many many more!